From early coaching days, Castle Square had become the commercial centre of town, when the Castle Inn after which the square is named became established. When the inn was demolished in 1823, the square was opened up into a broad thoroughfare which became the main coaching centre of the town, with most routes from London and other places terminating here. Numbers 1-8 on the south side of Castle Square are all listed buildings; number 1 was probably designed by Wilds and Busby in the 1820s. 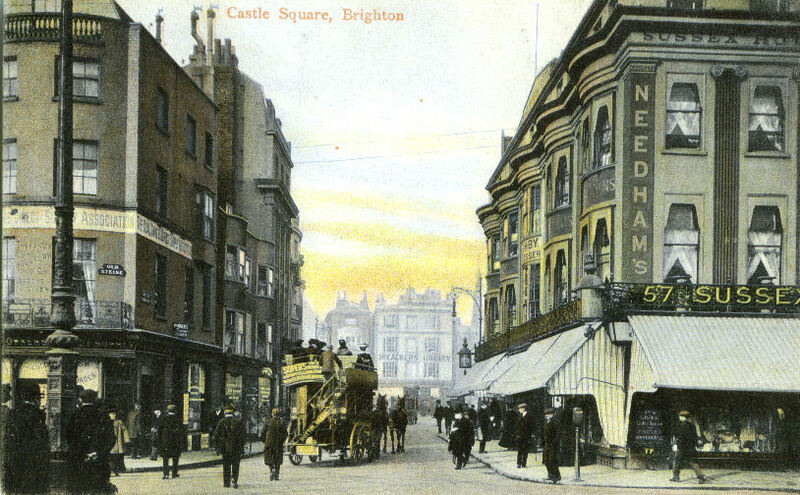 The view depicted is from Old Steine and dates from the first decade of the 20th century, at the time where horse drawn omnibuses were being replaced by motorised vehicles. Although Motor Buses operated there from 1903, the Horse Buses continued to run up until 1916. On the left-hand corner is the “Coal Owner’s Direct Supply Association” which occupied the site from around 1900 until 1920. On the right-hand corner is Needham’s, a well-known outfitter’s stores until it was replaced in 1933 by the art-deco ‘Electric House’. Thanks Jennifer, it’s great looking at before and now photos which often appear on this site. It’s easy to see the big changes when buildings are demolished, but I like looking for the subtle changes too. You can often see that windows are bricked up, balustrades removed, chimneys capped and roofs extended. Sometimes these changes are because of disrepair or necessity, but another reason for change especially in the middle to latter part of the 20th century was fashion. Just think how many period architectural features were removed in the 60s and 70s from the inside and outside of buildings just because they looked old fashioned. Looking around the street scene it’s nice to think where the people have come from or where they’re going to in that snapshot of life in days gone by. Looking on the corner of Needhams there seems to be what looks like a large modern day parking meter; it looks to be about six feet tall. Does anybody have any idea what it is or what it’s used for? How weird – I mean the giant parking meter! Could it have been some kind of telegraph device for use by police constables on the beat? I’m completely flummoxed. Both views are of East Street, from Pavilion Buildings, where I served a seven year apprenticeship with the newspaper Brighton & Hove Herald. I was a spotty faced office boy for the first year (1952-3) and had to deliver accounts to, among many others, Reason & Tickle who occupied the large white building blocking the fork ‘twixt East St and Bartholomews (centre of the picture). I liked going in there to get that big, beautiful smile from the assistant estate agent (who was several years my senior and way out of my league!). Actually, I’ve made a big mistake! Studying the modern picture more closely, I now see that I am looking from the War Memorial towards North Street. The blue tinted building in the right foreground is where Electricity House used to be, and of course the building I thought was Reason & Tickle is where Hanningtons once presided. So East Street is the second left in the picture and Pavilion Bldgs to the right. My other comments still stand. Apologies for my lack of observation. Is it me being daft or is that a parking type meter in the top picture at the bottom right hand side? Wonder if anybody can help me? I was born in Brighton and lived there until the early 1970s. There is a family story that my great grandfather (John? Standen) was a retired jockey and was killed in Castle Square/North Street when a horse he was taking to be shod took fright at a motor car (new fangled invention) and reared up, striking him on the head and fracturing his skull. I have tried to find any newspaper reports of this without success but I have found a death record of John Standen in Brighton in1902 -which looks about right. Does anybody else have any knowledge of this incident? Re the parking meter lookalike on the Needham’s corner, I can’t see any evidence of the semaphore arm signals that pre-dated traffic lights, so I think, like Brian, that it may be for some form of radio/telephone communication. The giant look a like parking meter is certainly a bit of a puzzle. My first thoughts were perhaps it was tramway paraphernalia but the trams never operated through Castle Square or up and down North Street. 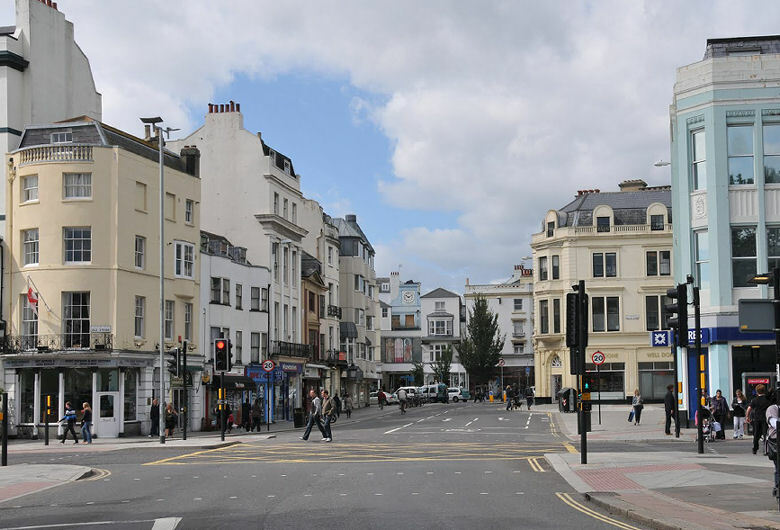 The tram rails etc ran up and down the east side of the Old Steine to connect with the Aquarium terminus. It may well be something to do with the other things already mentioned. Maybe we are reading too much into this! Is it simply a cast iron post about four feet high placed there to stop larger vehicles mounting the pavement in so doing damaging the shop awning? Looking at the photo with a magnifying glass, is the camera playing tricks with us? it may well be that the oblong top section is nothing to do with the post and is an object hanging from beneath the shop awning? Whatever it is I love these MyB&H challenges so many thanks Jennifer. Nice one John and Andy. So what was the item on display, Andy, and how much was it?! The parking meter lookalike is I think a street fire alarm that was sited in many places around town before the 999 system was used. It had a break glass window to operate the alarm.